Winterpills’ sophomore release continues and improves upon the dour psychedelia and multilayered brilliance heard in their 2005 debut. With bits of beautiful sorrow glimpsed just below shimmering pop surfaces, it’s a hypnotic triumph that reveals more with each listen. The record’s opener, “Lay Your Heartbreak,” is Mamas and the Papas meets Nirvana, with Philip Price and Flora Reed harmonizing like Buckingham/Nicks of the Zoloft set. The richly textured “Handkerchiefs” features Reed singing lead, guitarist Dennis Crommett channeling Revolver-era George Harrison, and gorgeous keyboard work from Price. Philip Price’s songwriting betrays a greater love of language than poetry. He can be forgiven when his wordplay cloys. Couplets like “pilloried in crushed mint/killing with a push pin” (on “Shameful”) and “blue eyes, June eyes/June eyes fly fly home” (“June Eyes”) are utterly inscrutable, but they sound too lovely in the end to matter. “Angels Falls” is more about cadences than anything meaningful, where Price’s lyrics are bits of shiny glass in a mosaic of sound and echo. “Broken Arm” is less oblique, an up-tempo number with an infectious chorus. It’s the most radio-ready song on “The Light Divides,” and a cleaned-up version is included as a hidden track. The ethereal “Eclipse” best sums up the album’s pervasive mood: “how our dreams entrap us,” sing Price/Reed. “I Bear Witness,” the ostensible title cut (it contains the line “I bear witness to how the light I shed divides on you”) is a sweet and sinister slow dance, a landscape seen by a drowning man just before his eyes close. “July,” a standout track with “Pet Sounds” studio gadgetry and an irresistible chorus, may be the most buoyant song ever written about a nervous breakdown. The still life “A Folded Cloth” gathers up and perfectly distills the elements of this painterly effort. 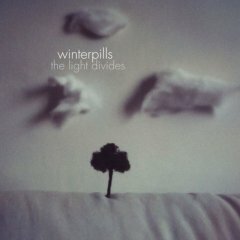 “The Light Divides” is a Mona Lisa smile of a record, cunningly calling listeners back to look and listen again, struggling to find the true secret of its beauty.